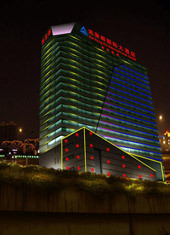 Open in April 2010, Guangzhou KaiRongDu Hotel, located in bustling Chigang business center at Jianghai Avenue #3, Haizhu District, Guangzhou, designed according to the national five-star hotel standard, is a high-end business hotel integrating accommodation, catering, sports, leisure, entertainment and conference together. It is 25-storey high and has 253 deluxe rooms and 2 presidential suits of exquisite style and comfort. Its interior decoration is elegant, graceful and unique, blending Chinese style with Western style. All guest rooms are equipped with bathroom, LCD TV, central air-conditioning, refrigerator, safe, liquid crystal computer and free broadband, giving you a feeling of leisure and relaxation. Unique decoration, "housekeeping-style" service, making you appreciate sincere and considerate service of the hotel everywhere. In the hotel conference centre, there are conference rooms, VIP reception rooms, business meeting rooms and the like, which are ideal places for high-level meeting, conference and business negotiation. The hotel also set up Western restaurant, Chinese restaurant, sauna center, KTV and chess-and-card room, providing comprehensive and multi-faceted services to guests. Business philosophy of the hotel: Customers' satisfaction is our eternal pursuit. 1. The Hotel is in 3 minutes by foot to the subway station ChiGang, which is just two stations away to the Canton Fair.